wwEncryption - ComputeHash() - HMACSHA1 returning incorrect results? 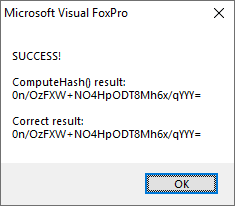 I'm looking to integrate Duo MFA with our web app and it appears the results of ComputeHash() using the HMACSHA1 algorithm are incorrect. I note from this post https://support.west-wind.com/Thread4X20165EC.wwt that there was a problem previously but I'm testing with WWC v 6.21. Here's the code I'm using to test it with that compares the results to those I get from https://www.liavaag.org/English/SHA-Generator/HMAC/. #DEFINE INPUT_TEXT		"A very approachable Test String with upper ASCII chars:"
*! *	The CORRECT_RESULT_BASE64 of "0n/OzFXW+NO4HpODT8Mh6x/qYYY="
*! *	was obtained from https://www.liavaag.org/English/SHA-Generator/HMAC/. *! *	NOTE however, that these sites all return different results when LFs are added! I can email or upload the wwc-hmacsh1-test.prg if that helps. This is uncharted territory for me so I'll be grateful for any assistance you can provide. re: wwEncryption - ComputeHash() - HMACSHA1 returning incorrect results? So took a look at the tester. First, the non-HMAC versions (with 1 iteration) all work just fine. The HMAC version works too but the algorithm names specified is wrong. It needs to be HMACSHA1 not HMACSH1. Once that's switched it matches. Looks like there's a problem in the documentation with the algorithm names not being right. The routine probably should throw if an invalid algorithm is used. I've updated the documentation. The markdown processing in the editor should be working now as well. This should make sure there's no weird ambiguities due to wrong parameters passed into the function which should avoid problems like what you reported here in the future.